Hope to keep folks up to date on my progress starting Ellis Cycles. For those who aren't familiar with my work or history, here goes. I've worked in bike shops since my Junior year of high school in '90 when I got my feet wet assembling 16" wheeled bikes at a "bike warehouse" in Schenectady, NY. It was an inauspicious start working in that tiny room with a chain smoker who assembled bikes with an impact wrench. I slowly moved my way up in that shop and then in 2 subsequent shops, each one a bit more challenging. In '93 I took a job at Serotta as a lowly bike prep/shipping guy. I had known Dave Kirk by reputation, and had raced against him in some local mountain bike races, but I got to know him at Serotta and he was the first one to show me how to light a torch and melt metal. My first work was a crude set of bar-ends, I got some snide comments from some of the guys, but Dave and Kelly Bedford both encouraged me to stick with it. In '98 my afterwork practice payed off when Ben offered me a chance to move into the brazing dept. I leapt at this and with a lot more guidance from Dave and Kelly I began to build my first frames. Thank you guys. After 2 years in the brazing dept. at Serotta I began looking a change in my life, at 27 I had lived in upstate NY for my entire life and needed to move on. I contacted Waterford, told them who I was and what I did and asked if they were interested. At this point they were one of the only companies still building production brazed bikes. I visited the factory and was convinced, one of the things that hooked me was their stainless lug bikes. I loved that look and wanted to build one myself. Well, I got that chance and more, in the last 8 years I've built stainless lug bikes of every size and shape, some pretty cool non-stainless bikes too. I'm grateful for the artistic freedom I had at Waterford and the chance to make my mistakes on someone else's dime! Hopefully not too many. It's been a busy first week, I have to thank everyone who has sent their well wishes and support. This venture will never be a success without your continued help. 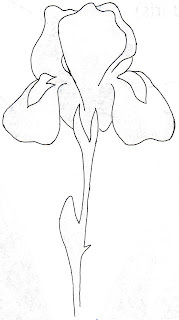 The iris drawing is the beginnings of my future logo and headbadge. My wife Lisa and I tend to a large iris garden compliments of my Mother in New York. Some of the plants have traveled from her uncle in Bellingham, WA to NY to our garden in WI. It's a lot of work, but every spring we are rewarded with spectacular blooms. I think it relates well to my framebuilding, the processes I have learned and honed over the last 10+ years are exacting, but the payoff is worth every file stroke and pass with emery. The drawing is just the beginning, more mundane things include trying to set up a meeting with an attorney to file papers, I get the feeling he may have bigger fish to fry. Getting decals designed and off to the shop seems to be the most important job right now as they are quoting a 2-6 month lead time. I'm keeping my fingers crossed for the 2 months! Other jobs include sourcing an alignment plate, not my forte, but so far have had some useful leads to follow up next week. Good luck and steady as you go!